The iPhone Dev Team has just released an updated version 0.9.6b2 of Redsn0w which is based on Geohot’s limera1n exploit and it can jailbreak iOS 4.1 on iPhone 4, iPhone 3GS, iPhone 3G, iPad (on iOS 3.2.2) and iPod touch 4G / 3G / 2G (Non MC Model only). Besides, this new version also offers custom boot land recovery logos for the older devices like iPhone 3GS (old bootrom) iPod touch 2G (Non MC), and iPhone 3G, along with the ability to let Windows users restore to a custom IPSW files that are cooked using PwnageTool for Mac. The instructions are exactly similar to the ones posted earlier for both Windows and Mac OS X users. 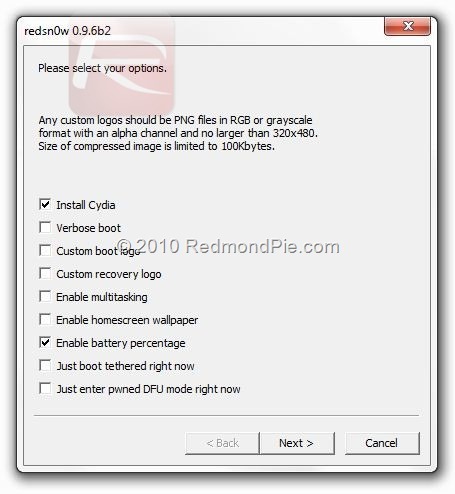 Simply download Redsn0w 0.9.6b2 for Windows or Mac from the links given below, and then follow the complete step by step instructions posted here (for Mac OS X), and here (for Windows) to jailbreak iOS 4.1. NOTE for Unlockers: Unless and until you are using it to restore to a custom ipsw file WITHOUT the upgraded 05.14.02 or 2.10.04 basebands, DO NOT use Redsn0w as it will upgrade your baseband to the latest version, hence making it impossible to unlock on iOS 4.1 (for now).